Providers, hospitals, health plans, and other partners have formed a “medical neighborhood” by connecting electronically in the health information exchange (HIE) provided by Hixny. Hixny—Healthcare Information Xchange of New York—is a local not-for-profit consortium that is helping doctors gain secure online access to their patients’ electronic medical records. 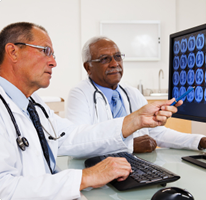 Electronic medical records (EMR) lead to better care coordination and can lower costs. They are an essential component of the CDPHP medical home program, Enhanced Primary Care (EPC). Hixny and CDPHP have helped numerous participating practices achieve meaningful use and qualify for federal incentives. What data is available to me in Hixny? The Hixny Health Information Exchange (HIE) contains comprehensive patient medical information gathered from a variety of sources including primary care providers and specialists; patient medication history; patient demographic and allergy data; lab results; image reports; hospital discharge summaries; and other patient data. Will my EMR system interface with Hixny? Providers can access the HIE through the Hixny portal or through their own electronic medical record (EMR) system. Find out which EMRs are interoperable with Hixny.